Don't waste your time with remote debugging your application: now EurekaLog debugs it for you. 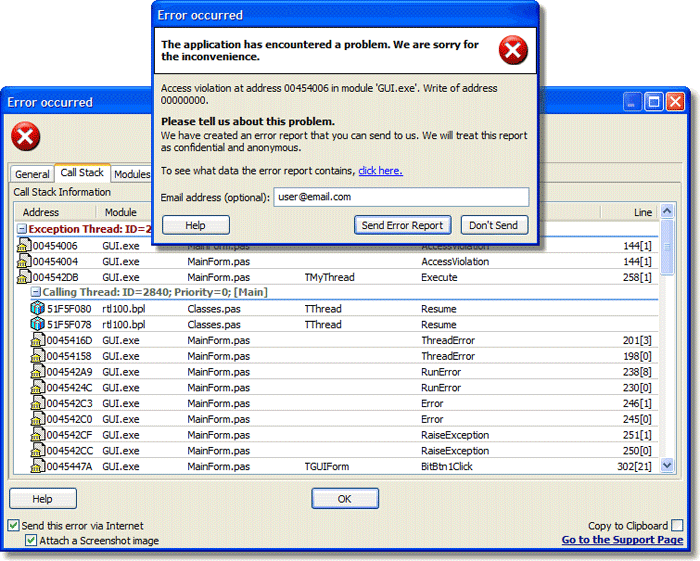 It will send an email message on every exception thrown, with a log file and screenshot attached. If you have a bug that multiple users report, but this bug cannot be repeated, no matter how hard you try, EurekaLog is about the only solution for this problem. With EurekaLog, now you can code a detection method that triggers a notification when the bug happens. With EurekaLog, your application is able to catch all exceptions and memory leaks directly on the end user PC, and generate a detailed log of the call stack with unit, class, method and line-number information. All you need to do is ask your users if they can replicate the bug. If yes, you can have them replicate it and send the error report to you or to a bug-tracker, and finally find out what triggers the bug. EurekaLog does not affect the performance of your application, as it only executes when an exception is raised. EurekaLog increases the compiled file size by about 300Kb (this space is needed to store the compressed debugging information). EurekaLog .NET Edition requires the .NET Framework 2.0 or higher, and is compatible with Visual Studio 2005, 2008 and 2010. EurelaLog.NET works on all modern Windows platforms, from Windows XP to Windows 7. All EurekaLog versions are covered by 60-day money-back guarantee. If you are not satisfied with your purchase for any reason, just ask for your money back and you will be refunded. EurekaLog VCL Edition is compatible with all Delphi versions from 3 to XE, and with C++Builder from 5 to XE. 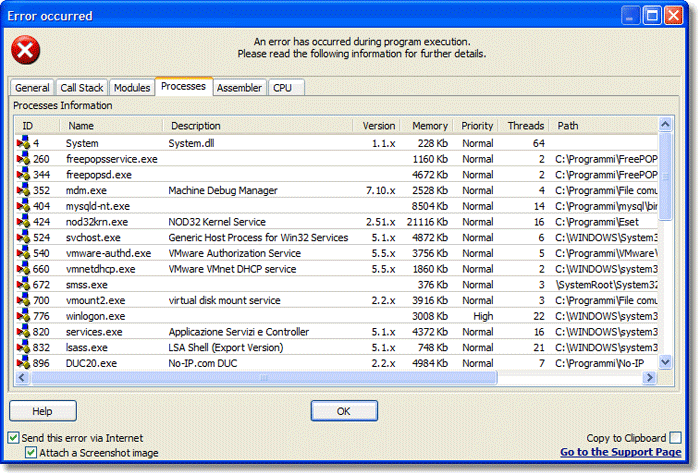 EurelaLog works on all Windows platforms, from Win 95 to Windows 7.